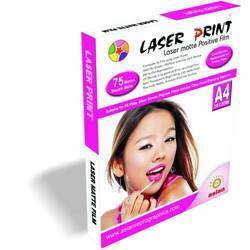 We are a leading Manufacturer of direct laser positive film - 2115 - copper from Chennai, India. With the assistance of our team of professionals, we are able to manufacture and export a superior range of Direct Laser Positive Film. These are especially treated using premium quality materials to provide gives perfect reproduction of images which improves the print exposure quality on screen and PS plates. These are primarily used for Silver Screen & Photo Polymer Plate exposing. These are both side coated matte finish, translucent, bright white, ideal for stack feeding. In-line stabilized provides superior dimensional and heat stability for good registration. Anti-static coating ensure for sharp and smooth image. Looking for DIY Photo Book ?